Jonathan Gooing graduated from the University of Sheffield in 1996, where he studied piano with Yolande Wrigley. While an undergraduate, he won many prizes, including the Sir Thomas Beecham Music Scholarship, the final year recital prize and the piano accompaniment award. In 2007 he gained a MMus degree researching and performing Schubertʼs song-cycle Winterreise. He has accompanied many leading musicians, including Jean Rigby, Roderick Williams and Claire Rutter. 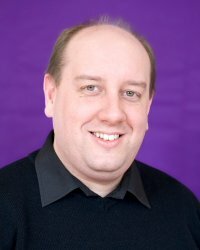 In addition to working at the RNCM, he teaches piano, is accompanist at the University of Sheffield and is senior lecturer in music at Bishop Grosseteste University College, Lincoln. As an organist, Jonathan has performed in the Cathedrals of Lincoln, Sheffield, Ripon and York, as well as Symphony Hall, Birmingham and with the Halle at the Bridgewater Hall, Manchester. In 1999 he won the Yamaha ‘Birmingham Accompanist of the Year’ Award.